The atomic detonations at Hiroshima and Nagasaki at the end of World War II instantly generated over 100,000 burn casualties. Because of this event, the Army was made keenly aware that burn injuries would be a major problem in future conflicts. Consequently, the U.S. Army Surgical Research Unit, later the U.S. Army Institute of Surgical Research (USAISR) at Fort Sam Houston, Texas, has had a major focus on burn injury since 1949. 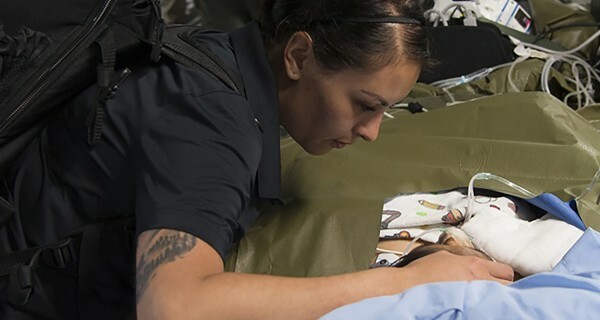 The USAISR Burn Center has cared for major burns from all military conflicts beginning with the Korean War, including almost 1,000 patients from Iraq and Afghanistan. The creation of the U.S. Army Burn Flight Team (BFT) in 1951 gave the DoD the ability to care for burn and polytrauma patients world-wide. Military and civilian members of the BFT are employed at the Burn Center’s Intensive Care Unit (BICU) and can deploy worldwide within two hours for both military and civilian patients to provide specialty care while in flight. Since its inception, the BFT has been called upon for assistance with a number of high-visibility, high-profile military and civilian emergencies around the world. The Institute’s research in combat casualty care and the advancements in technology have given the BFT the ability to transport patients more rapidly to the Burn Center while providing specialized care to patients who may have not survived decades ago. For instance, in 2012 the BFT set a new record for the longest continuous flight by flying for 19 hours on a non-stop flight from Singapore to San Antonio and traveling more than 9,850 miles, surpassing its previous longest flight by more than 3,000 miles. In 2013, the BFT teamed up with the San Antonio Military Medical Center Extracorporeal Membrane Oxygenation (ECMO) Team and the Air Force 59th Medical Wing’s Critical Care Air Transport Team to perform the first in-flight ECMO mission. ECMO is a heart-lung bypass system that provides lifesaving support for patients who cannot survive on a ventilator alone. In 2015, the Team added a new capability to its arsenal of critical care equipment by providing the first in-flight continuous renal replacement therapy (CRRT), a kidney dialysis machine. CRRT is routinely used in the BICU to purify the blood of toxins through a filtration system and to assist in fluid removal. In February 2017, the BFT set another record when it once again teamed up with the ECMO Team and the Air Force CCATT to provide the first in-flight ECMO and CRRT. The BFT continues to standby for any mission, anytime, as history shows that it can be called upon to deploy and provide critical care for any incident. During the 1970s and 1980s the BFT conducted hundreds of missions. In 1979, the BFT was deployed to Camp Fuji, Japan, after a U.S. Marine Corps barracks caught fire from a gasoline leak caused by a powerful typhoon. Thirty-nine of the most severely burned Marines were transported to the USAISR Burn Center for care. In the 1980s, the BFT was deployed to places like Beirut, Lebanon, the Persian Gulf, and to Bashkirian, Republic of the Soviet Union. There, two passenger trains were destroyed when a leaking natural gas pipeline exploded, killing over 400 and injuring another 800. The ISR deployed a 17-man burn care team to assist in that disaster. That was the first U.S. and Soviet Union joint effort since World War II. The Team was deployed in 1994 to the “Green Ramp” disaster at Pope Air Force Base, North Carolina, when 24 members of the Army’s 82nd Airborne Division were killed after a mid-air collision of a fighter jet (F-16D) and a C-130. Forty-three badly burned Soldiers were transported to the Burn Center. The Burn Flight Team continues to assist when called upon. Most recently, the Team was deployed to Guatemala to transport six critically injured pediatric patients to the Shriners Hospital for Children in Galveston, Texas. Patients were severely burned after the Fuego volcano erupted in the early summer of 2018. So whether civilian burn patients need to be transported to the U.S. for specialized treatment or a service member needs to be treated at the ISR Burn Center, the BFT is ready to deploy worldwide to assist in the assessment, evaluation and treatment of casualties sustaining burn injuries related to both combat and non-combat events. The ISR’s involvement in a mass casualty burn injury would depend on the number of people injured, the cause of the incident, and the location. If the incident occurs overseas, then we would more than likely deploy the Burn Flight Team as we’ve done in the past. The BFT would assist in assessing, evaluating and treating the injured, and if needed, transporting casualties to the Burn Center. It would be a different scenario if it happened in our backyard. The first thing that we would do is to alert all Burn Center personnel and the leadership at Brooke Army Medical Center (BAMC), since we are collocated with them. We would next set up an operations center in the Burn Center to coordinate all aspects of incident response. Next, work schedules for the staff members would be rearranged, but not all personnel would be on duty at the same time so that we could operate 24/7 with rest cycles. Once that has been established, we begin to triage patients. For a large number of patients, this may be done outside of the hospital, so that we don’t admit a patient who doesn’t require inpatient care. Burn Center beds are limited. Every burn center has what is known as “surge capacity,” which means that it should be able to expand by 50 percent of its bed capacity in an emergency. At the ISR Burn Center, our bed capacity is 30 beds based on staffing. That’s 12 beds in the BICU and 18 in the Progressive Care Unit. Our physical capacity is 40 beds—16 BICU and 24 PCU. So in our case, we would have to determine the most severely burned patients to admit while at the same time assess the need to admit patients with a lower acuity level to other wards at BAMC on a temporary basis. That doesn’t mean that the Burn Center staff wouldn’t treat those patients. Our staff would provide subject matter-expert support such as mentorship and supervision to the staff of those wards. An important step would be to alert the American Burn Association, the leading national civilian organization for burn providers. During a major emergency, U.S. burn centers let the ABA know how many beds are available within their respective centers, in case we cannot support an overwhelming number of patients. Then we would do what is called “secondary triage.” We would reevaluate patients who were admitted to the Burn Center and identify those who can be transferred elsewhere. These patients would include inpatients who were admitted pre-disaster and some lesser injured patients from the disaster. Our last step would be to coordinate with local and regional burn centers to redirect new patients there, and/or admit patients in transfer after the secondary triage. It is a very coordinated effort here as well as with the ABA. The ABA disaster plan envisions a three-tiered response to a major burn disaster: 1) state and local response systems; 2) the National Disaster Medical System, which, for example, oversees the Disaster Medical Assistance Teams; and 3) Defense Support to Civil Authorities, which includes a whole host of capabilities to include the BFT. The Burn Center also serves as the regional burn center for 22 counties in South Texas for civilian patients. Annually, we admit approximately 625 burn patients and 75 non-burn necrotizing problems such as soft tissue infections, desquamative skin diseases and soft tissue trauma from accidents. Those numbers include military, DoD beneficiaries and civilians. This peacetime mission provides a unique service to the local community, while ensuring the Burn Center’s readiness to respond in wartime and in civilian disasters alike.